Giant pandas have a thumb pad on the hand. They have white with black patches around the eyes, ears, shoulders, chest, legs, and feet. This black-and-white coloring may camouflage (hide) the panda in the snowy, rocky environment. They're also a good tree climbers, and can swim to escape predators. Giant pandas are similar to other bears in their general looks, the way they walk and climb, and their skull characteristics. It's important to know that pandas are bears, because the more we know about pandas, the better we can help them reproduce and survive. 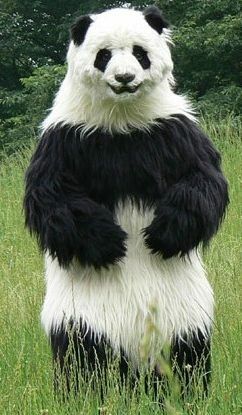 Giant Panda, with only about one thousand left in the wild, is also the most well known endangered animal in the world. The rare animal is endemic to China, though some of the habitats were found in northern Vietnam and other nearby areas over half a million years ago. Giant panda cubs weigh 45 kg (99.2 pounds) at one year, and live with their mothers until they are 18 months to two years old. The interval between births in the wild is generally two years. Here's to read more about Ocean Park, attraction reviews by HK travelers and question specially in getting there.